If recent horror movies should have taught you anything, it's that A) kids are creepy (especially little girls), B) you should not buy any old items from yard sales or explore objects found in attics/basements/crawlspaces because C) demons love to haunt those items and make personal connections with aforementioned creepy kids in the process. 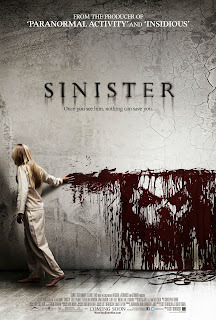 Starring Ethan Hawke and directed by Scott Derrickson (who wrote The Exorcism of Emily Rose), Sinister follows true-crime novelist Ellison (Hawke) as he researches the story behind a home movies found in his new home, which had previously belonged to a family who was murdered. Based on the trailer, Ellison may have stumbled onto a pagan demon who lives within images - such as in found-footage movies - and inhabits children by entering through them. Sinister debuted at South By Southwest last March to largely positive reviews, and will open wide on Oct. 5.